Major General R. P. Hartle. APO 305, U. S. Army. I am glad that you arrived back home safely. I hope you will find time to visit us again sometime. It was a real pleasure to have you and Gee with us. I wish you could have been there at the end, as the sight of so many German prisoners being herded into the cage was a real treat. 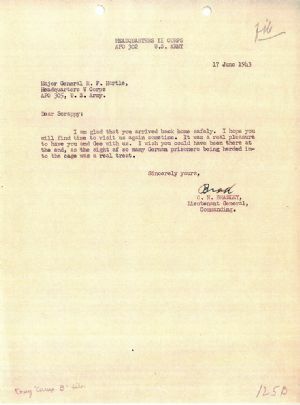 During the final battles of April and May 1943 he [Bradley] achieved his goal. The II Corps attacked northward toward Bizerte, avoiding obvious routes of approach and using infantry to attack German defenders on the high ground before bringing up the armor. The 34th Infantry Division, maligned by the British as a unit with poor fighting qualities, fought the crucial battle and dislodged the Germans from strong defensive positions astride Hill 609, the highest terrain in the corps sector. With tanks in the assault role, the 34th Division infantry cleared the obstacle, allowing Bradley to send the 1st Armored Division through to victory. American troops entered Bizerte on 7 May, and two days later more than 40,000 German troops surrendered to II Corps. From: Omar Nelson Bradley, The U.S. Army Center of Military History.